The mediaeval parish of St Mary’s, Hornsey, formed in the thirteenth century, stretched from Stoke Newington in the South to Friern Barnet in the North. By the start of the nineteenth century, it still covered the areas from Finsbury Park up to Muswell Hill, with the Parish Church on Hornsey High Street next to where the Greig City Academy is now. As the suburbs of London expanded in the nineteenth century (with the expansion of the rail network) and much of what was originally parkland was filled with new housing, there was a need to provide additional Churches and priests to serve these expanding communities. The first of these was St Michael’s, Highgate in 1834, and was soon followed by others such as Holy Innocents on Tottenham Lane. In 1878, a new parish was formed out of the parishes of Holy Innocents, Tottenham Lane and Saint John the Evangelist, Brownswood Park to be Holy Trinity, Stroud Green. 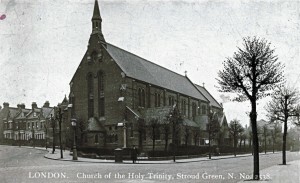 Holy Innocents placed a temporary mission hall on the corner of Granville Road, called the Iron Room, which was dedicated on the 31st December 1880. A permanent church was also built on the same site as the mission hall, whose foundation stone was laid in April 1880. 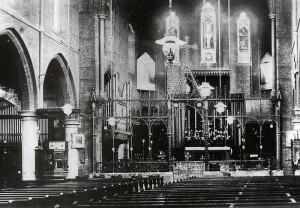 The church was consecrated on 10th May 1881 and the Iron Room, which had become over-crowded, was used as the church hall. The architect of the church was Mr B. Edmund Ferrey, and it was built by Messrs Mattock Bros. 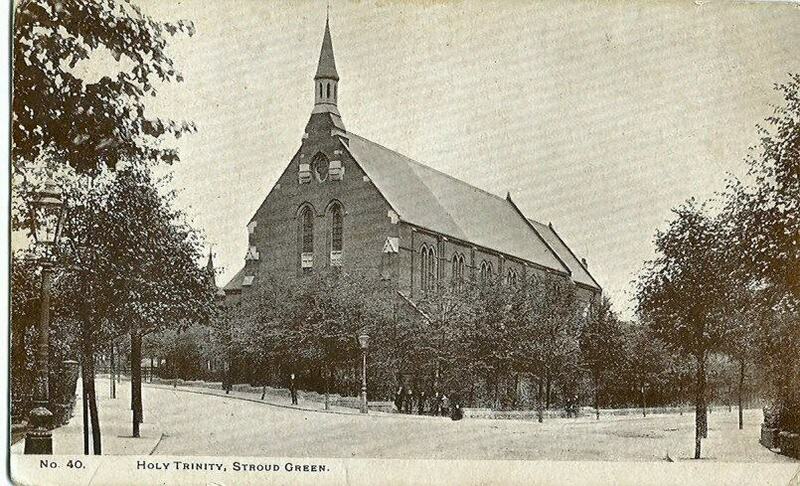 The spire design was passed to the Council in February 1882, and the new church finally finished by January 1885. A brick hall was built around 1913 to replace the Iron Room. The Rev’d Mr John Robertson (1852-1913) was a London Diocesan Home Missionary who was put in charge of Holy Trinity, Hornsey from 1878, when the parish was created, until 1880. In 1880, work on the church began and a living instituted with Fr Robertson as the first vicar. Money for the church and parsonage came from two foundation benefactors, including one Mr Joseph Lucas. In 1885, Fr Robertson was nominated to another living at St Mary’s, Kilburn, and as patronage for Holy Trinity lay with the Bishop of London, the Rt Rev’d Mr John Jackson, it was his duty to appoint a successor. The Bishop and the parishioners, and especially one churchwarden, a ‘staunch evangelical’ Mr Alfred Tubbs, were keen that the next incumbent should preserve parish’s low churchmanship. However, Bp Jackson died in office a few days after this announcement, and although Fr Robertson wrote to the new Bishop of London, the Rt Rev’d Dr Frederick Temple, to defer his institution at St Mary’s, it went ahead before the legal requirements of the enthronement of Bp Temple had been fulfilled. This meant that the Bishop was not in a position to appoint to Holy Trinity and the presentation reverted to the Prime Minister on behalf of the Crown, Mr William Gladstone. 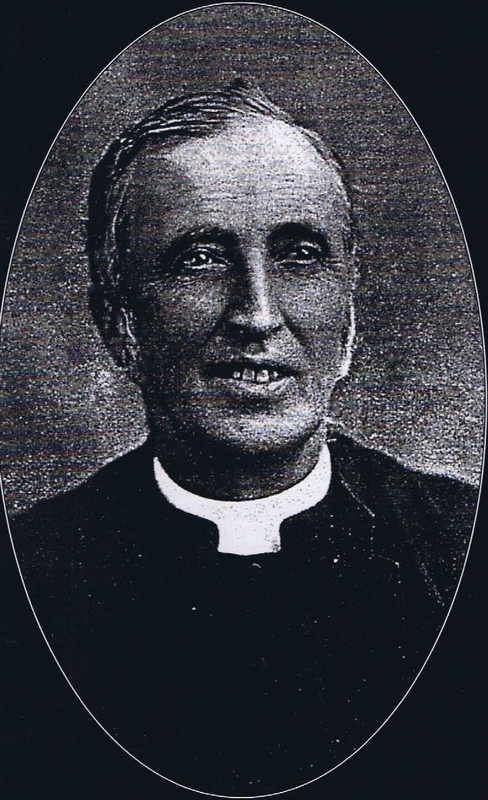 Although Mr Gladstone knew that the worship in the parish of Holy Trinity was of an evangelical nature, his appointment was the Rev’d Dr Robert Linklater (1839-1915), then priest in charge of the Winchester College Mission at Portsea. Fr Linklater’s views and convictions were well-known to be of an Anglo-Catholic nature, which caused considerable outrage in the parish. One occasion, Fr Linklater received a protest against his appointment signed by more than 900 parishioners, along with a ‘cordial address of welcome from more than fifty communicants of Holy Trinity’. Mr Gladstone on another occasion received a letter from Mr Tubbs, the churchwarden, enclosing a Memorial ‘signed by 1266 bona fide residents in the parish’. Both Mr Gladstone and Fr Linklater, however, felt duty-bound to uphold the decision and on Monday 17th August 1885, Fr Linklater was instituted to the vicarage and subsequently inducted on Sunday 23rd. During his time at Holy Trinity, Fr Linklater was further appointed to a prebend at St Paul’s Cathedral, which caused more upset from the wider Church body on account of his Catholic practices. His institution to Holy Trinity had resulted in a number of resignations from the laity, but dissent gradually died away and the Anglo-Catholic tradition has been preserved in the parish since. Fr Linklater retired from his unified congregation in 1910, and died at his home in South Kensington in 1915. The new church hall, built in 1913, was dedicated to him, and a cope, given to him by Mr Gladstone on his death in 1898, remained parish property and can today be found on display in St Aidan’s VC School next door to the church. 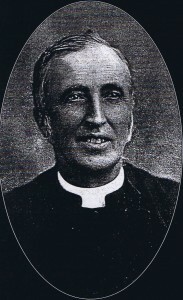 Fr Linklater was succeeded by the Rev’d Mr Arundell. In 1926, the Rev’d Mr Aidan Hancock was transferred from St Peter le Poer on Colney Hatch Lane. He was succeeded in 1940 by the Rev’d Mr Marsden, who died in office in 1944. In July 1944, the church was damaged by a V1 flying bomb along with much of the surrounding residential area. It was the decision at the time to put any money the community had into re-building houses rather than the church. In June 1951, it was decided that the building was unsafe and the church was closed, the congregation using the brick hall as a temporary worship space. Eventually, the church was pulled down in the 1960s and the hall was adapted for use as the permanent church, having a portico and spirelet added. It was dedicated on the 15th March 1961. 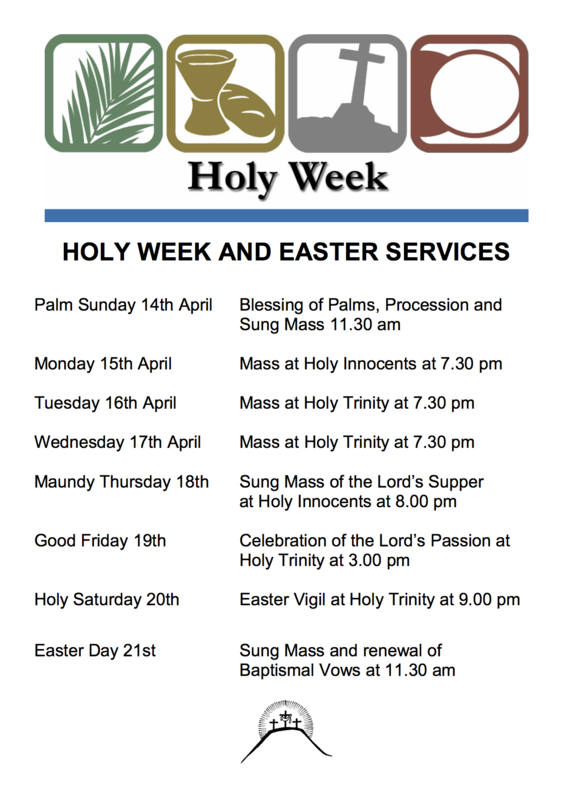 In 1981, following the church’s centenary year, Holy Trinity parish was joined with that of St Luke, Mayfield Road, Hornsey. St Luke was adopted as patron of the parish and a statue of him was moved to Holy Trinity church, along with much other furniture. Fr. Brooke Lunn, who had been Vicar of St. Luke’s, became the Vicar of Holy Trinity and remained in post until his retirement in 2002. After a brief period with Fr. Nigel Asbridge as Priest in Charge the current Vicar, Fr. Patrick Henderson, was inducted in February 2007. 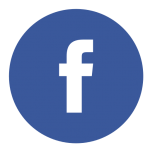 Please bear with us as we upload more information to this page. A downloadable document is also available, and will be updated with further information soon. Thank you for your patience.